Radiant's AR/VR lens features a unique optical design specially engineered for measuring the visual quality of near-eye displays inside augmented and virtual reality headsets. The Radiant Vision Systems AR/VR lens features aperture characteristics that replicate the human eye in NED headsets, including an entrance pupil positioned directly at the headset eye lens. Radiant Vision Systems, a leading provider of visual test and inspection systems for lighting and display devices, announces the release of a new AR/VR lens for Radiant Vision Systems ProMetric® imaging photometers and colorimeters. The AR/VR lens features a unique optical design specially engineered for measuring the visual quality of near-eye displays (NEDs) inside virtual (VR), mixed (MR), and augmented reality (AR) headsets. The lens design simulates the size, position, and field of view of the human eye, featuring an aperture at the front of the lens to position the imaging system’s entrance pupil within NED headsets at the same location as the human eye. By mounting the AR/VR lens directly to a ProMetric® imaging photometer or colorimeter, Radiant Vision Systems now offers the first solution for in-headset near-eye microdisplay measurement, including display technologies based LED, LCD, OLED, and projection. Radiant TrueTest™ Software provides the leading test suite for display measurement, as well as specialized tests required in AR/VR testing, with the capability to sequence tests for rapid evaluation of all relevant display characteristics in a matter of seconds, applying selected tests to a single image captured by the camera. Standard tests in TrueTest include luminance, chromaticity, contrast, uniformity, mura (blemishes), pixel and line defects, and more. Unique tests for AR/VR display analysis include Slant Edge Contrast (for MTF measurement based on ISO 12233), Image Distortion (for distortion characterization), Image Retention/Sticking, and X,Y position reported in degrees (°). With this complete Radiant solution configured for exact application needs, manufacturers can realize an efficient measurement process with the benefit of a single provider with end-to-end support. 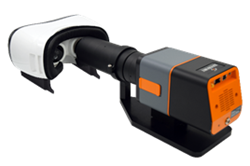 The AR/VR lens is an optional mounting accessory for Radiant’s 16- or 29-megapixel CCD-based ProMetric Y Imaging Photometer or ProMetric I Imaging Colorimeter. By mounting a lens directly to a ProMetric imaging photometer or colorimeter, the AR/VR lens offers the most efficient means of measuring NEDs as a turnkey, compact camera/lens solution that requires minimal setup and integration time, equipment, or expertise. The AR/VR lens can easily be removed and replaced with standard lenses for additional display measurement applications, such as testing displays outside of headset equipment or on the production line. Radiant Vision Systems integrates thousands of inspection solutions into production settings worldwide, with proven expertise defining measurement systems to meet exact requirements for unique display design and quality control applications. For additional information about Radiant Vision Systems light and color measurement solutions like the AR/VR lens, visit http://www.RadiantVisionSystems.com. Radiant Vision Systems works with world-class brands and manufacturers to deliver creative visual inspection solutions that improve quality, reduce costs, and increase customer satisfaction. Radiant’s legacy of technology innovation in photometric imaging and worldwide install base date back more than 25 years and address applications from consumer electronics to automotive manufacturing. Radiant Vision Systems product lines include TrueTest™ automated visual inspection software for quality control, and ProMetric® imaging colorimeters, photometers, and light source measurement systems. Radiant is headquartered in Redmond, Washington, USA, with strategic offices in China and South Korea. Radiant has been a part of Konica Minolta’s Sensing Business Unit since August 2015. For more information, visit http://www.RadiantVisionSystems.com.